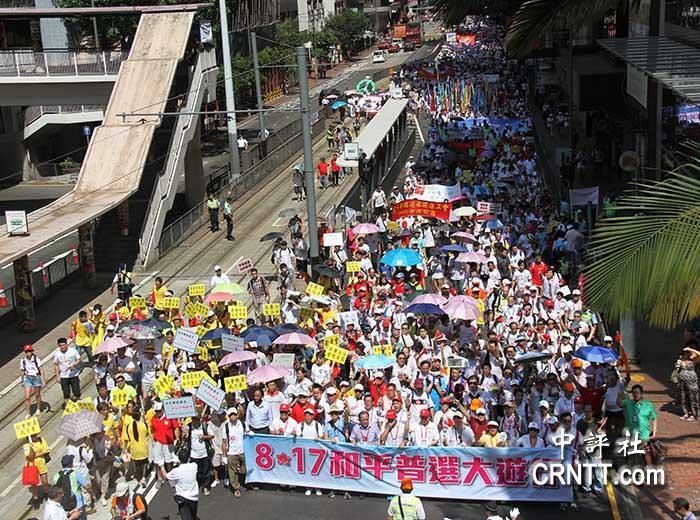 More than 190,000 people in Hong Kong joined a Sunday parade as the final stage of the Peace and Democracy movement opposing Occupy Central and supporting a peaceful and legitimate way to determine how the region's next chief executive would be elected through universal suffrage. Calling Occupy Central a "disaster," this is a strong voice uttered by the majority of citizens living in the international financial center who usually remained silence on political issues and fixed their attentions in their own businesses. As the time of the universal suffrage in 2017 that China's top legislature has promised approaching, each eligible Hong Kong voter is going to be given an opportunity to have a say on who would become their next leader, a democratic right never enjoyed before Hong Kong's return to the People's Republic in 1997. However, a few people instigated a movement calling on citizens to occupy Central, Hong Kong's iconic heart for financial and political facilities, if the election of the next chief executive by universal suffrage is not "consistent with accepted international standards." No matter what attitude toward Occupy Central movement he or she holds, such an idea has planted a society-tearing concept that could eventually drive Hong Kong into chaos and depression. Opinion of the silent majority should not be kidnapped by a handful of people. So, they stepped forward Sunday and told the extremists that any action or proposal violating the laws, such as occupying Central and civil nomination for chief executive candidates, are not popular in Hong Kong. The Peace and Democracy movement has collected endorsements on the internet and at signing stations by more than 1 million local people who expressed their strong willingness that Hong Kong needs stability and rule of law. Occupying Central, as rehearsed by some young citizens on July 2 early morning at Charter Garden, could paralyze Hong Kong's core businesses, bring billions of dollars economic loss and frighten thousands of overseas tourists. It could not threaten the central government and could bring nothing to Hong Kong's constitutional reform but breaking the laws. The constitutional reform in Hong Kong should not be a zero-sum game. Negotiation and consultation under the Basic Law and the top legislature's decisions will help different social parties reach consensus, which is the only way that could lead the region to future democracy and prosperity. Hong Kong, the first region in which Deng Xiaoping's "One Country, Two Systems" principle has been implemented, should become a democratic model to follow. Agree to Disagree, Hong Kong should not stop development steps simply for different political views.